If you'll be spending time in Dennis during your visit to Cape Cod, consider visitin Scargo Tower off of Scargo HIll Road in Dennis. The present cobblestone structure was built in 1901 after two separate wooden towers were destroyed, the first time by a storm and the second time by a fire. The original installation was built as a tourist observatory, so it is fitting to come and see it while visiting the Cape. 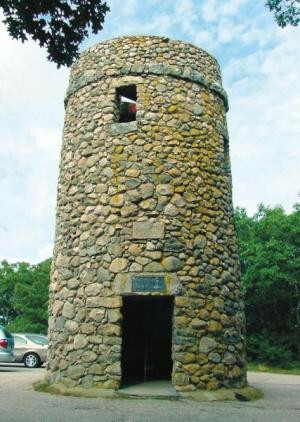 The 30-foot tower overlooks Scargo Lake and has some commanding views from atop the highest hill on the Mid Cape. On clear days, it is said that you can see as far as Plymouth and Provincetown. If you really want to enhance your view, try bringing a pair of binoculars up to the top with you. The tower is free to the public and is worth the trip. It can be particularly fun for small children who may be inclined to imagine the tower as a castle. A short climb to the top of Scargo Tower will be rewarded with a great view of Scargo Lake and Cape Cod Bay. Maggie Kulbokas photo.